Since the explosion of motion picture and film production in Michigan, Damark Marine Towing offers motion picture and logistics support on the Detroit River, Lake St. Clair and parts of Lake Huron, we will get the shots you desire, we have highly skilled licensed captains on staff and a number of support boats and barges to assist your staff in your production needs. Our full service home port is located on the Detroit River in Gibraltar which will provide complete access to our waterways. We can also provide lifts and equipment storage at our state of the art facility. Big or small, Marine One has you covered. Call 734-675-0710 or request more information here. 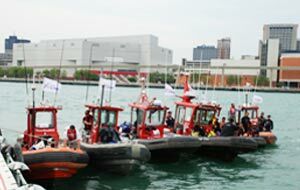 Damark Marine Towing established in 1999 we not only offer towing and salvage services, we offer Special Project support. We can assist your company or organization support in any event. We also aid in oil spill clean up projects around the state. 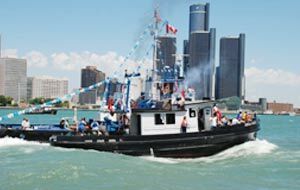 Damark Marine Towing has been serving the Southeast Michigan waterways since 1999, we are there for the general public, government, businesses and organization in need of our assistance.